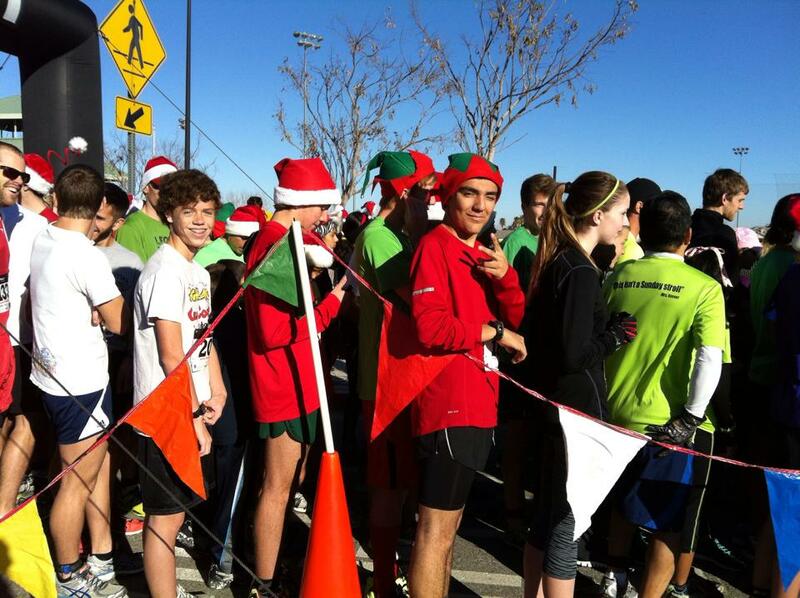 I got to run the Jingle Bell Jog! It has been difficult to run this race of late as I have been responsible for the timing and results. For 2013 though, I pushed to hire a timing company to come in and help with that. It was awesome. Everyone got a chip. The race started. The race ran. There was results up on a bulletin board almost immediately. Awesome! 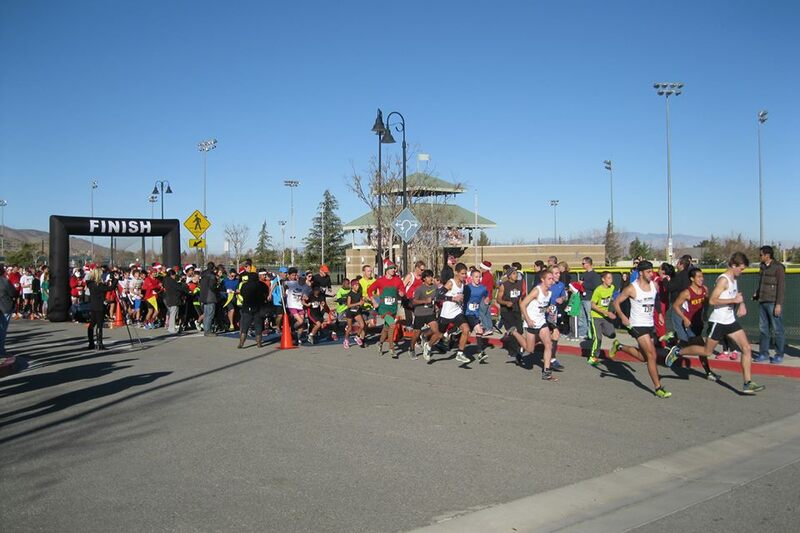 Today’s race was the final event of the High Desert Runners Grand Prix Points Series. So today, regardless of how many other races someone might have done, today, placing points counted! The points leaders, Erik, Krysti and Steve would be there to maintain their position. I would be trying to hold of Cade from taking my 4th place spot. Clay would be trying to get into the top 10. There were lots of interesting stories to take place. There was one oddity of the race setup. 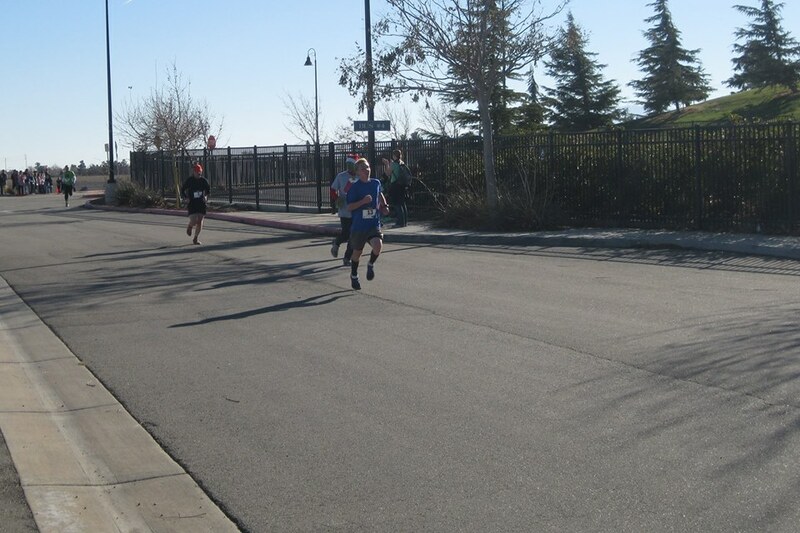 They made us race through the finish chute so that all the runners would run across the mat to start their chips. 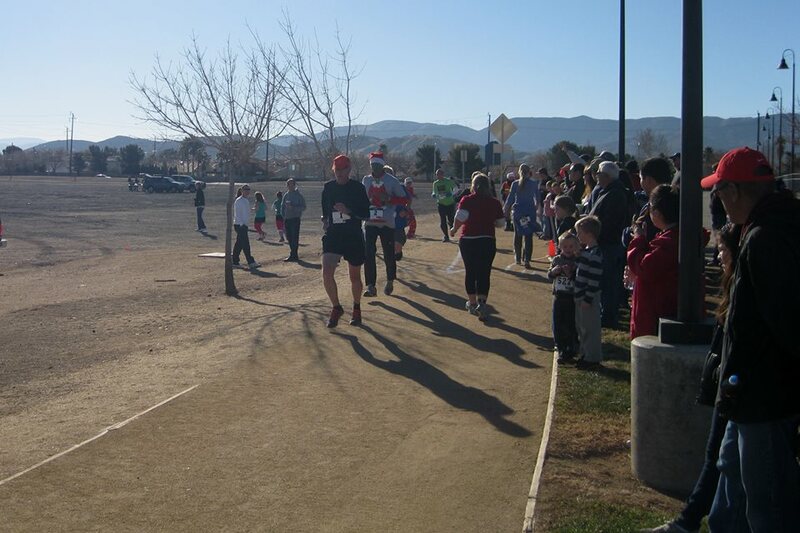 It was a pretty narrow way to start a race with almost 300 participants. Once I figured this out I made sure to be up near the front. The race started and I got off the line unimpeded! Erik, Oscar and Joe Kim were up there with me and they all got away even quicker! I felt my pace was right and they were all pulling away. My pace was a fairly speedy 6:40. From about half a mile to about a mile and a half. I was battling Brock Ruble. I could tell he REALLY did not want me to beat him. I would get a half step behind and he would spot me. The thing is, he would turn and look at me a bit. As he did he would swerve a bit in that direction which cut me off. Several times I had to shuffle step and pull up on the opposite side. I finally got by around 1 3/4 miles in. 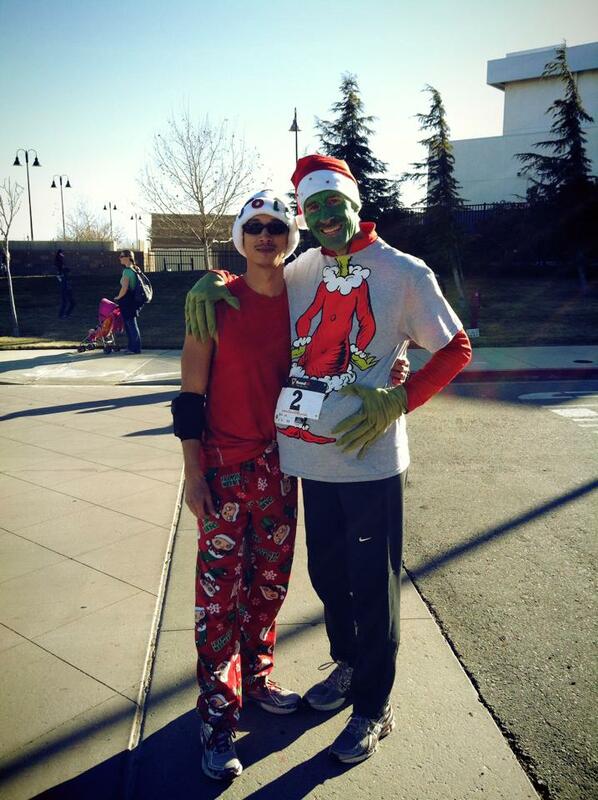 I was amazed that Clay could run that well on a fairly warm December morning with all the extra layers, the pillow belly and the face paint. 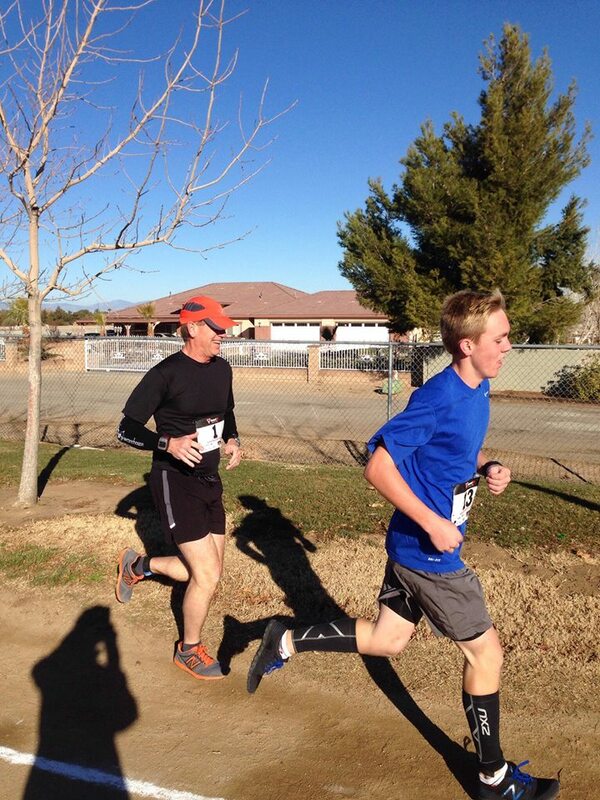 Clay’s goal was just to get 2nd place points in our age division (Steve Brumwell would get first). Clay new he could out sprint me. So he just caught me and ran with me till the end. He pulled ahead and then let up so that I could pass. His chip time, though was ahead of me since he started farther back in the pack. As the race went along we got closer and closer to Oscar. At the same time, this guy in red caught up with Clay and I. After several glances I figured out it was Jose Estrada. Jose, Yeni and Stefani moved to Santa Clarita after Stef graduated from Hillview last year so I have not seen them in a while. On the last stretch Jose caught Oscar, I caught Clay (he let me) and that young man in Blue from two pics above… he caught me. I was really impressed that Brock hung in there and stayed close enough to get me. In the end, it was mission accomplished on all accounts. Krysti won her age group for 6 points and an uncatchable lead. Erik won his and cemented 2nd place. Steve won his and has 3rd place locked up. My 3rd place a/g earned me 4 points, plus one for volunteering. Cade, meanwhile was the 7th finisher of the race for 6 points even though he was second in his division. This leaves me with a 3 point lead on Cade with one more weekend to go. Natalie Gutierrez had run away from me at the beginning and finished 2nd female overall in 21:24. Her 10 points moved her past Kathy Diorio into 6th place. Jim Pandya ran, helped and held onto 8th points, only 1 ahead of Clay though who’s second place leap frogged him into 9th place. See points here…. Oscar, is looking great- he stayed ahead of me the whole race! In his 30 something age group, it was only good for 6th place. He had an impressive list of guys ahead of him: Karl, Caleb Schroeder, Aleksey, Jose and Andy Helme. You’ll be 40 soon Oscar… but then so will Aleksey. Well, I could keep going…. lots of results…. click here and dig in! Considering your limited training 22:07 is a great time! I was pleased to read nothing about your knee. That must mean it is feeling good?